Comparatively little is known about Viking age weapons, and even less is known about how the weapons were used. This limited knowledge is due to the limited sources we have available for the study of Viking age weapons and their use. This series of interlinked articles summarizes what is known about the weapons and speculates about how the weapons might have been used. Virtually every free man owned and carried a weapon and was familiar with its use. The effects of these weapons on flesh and bone have been documented in a Hurstwic Viking Weapon Test Cuts video on YouTube. These articles on Viking weapons have been updated and expanded in the book, Viking Weapons and Combat Techniques published by Westholme Publishing. The book is once again available from your favorite bookseller. But please be aware that in the years since the book was written, our research has advanced. Some of the ideas in the book no longer represent our current thinking about how Vikings fought and used their weapons. 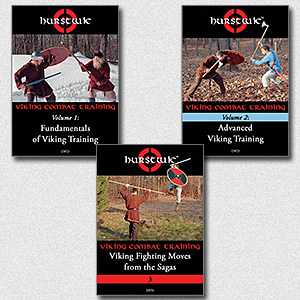 Our Viking combat training approach is taught in a series of training DVDs, Hurstwic® Viking Combat Training Volume 1: Fundamentals of Viking Training, Hurstwic® Viking Combat Training Volume 2: Advanced Viking Training, and Hurstwic® Viking Combat Training: Fighting Moves from the Sagas. The DVDs are now available from Hurstwic, LLC and other merchants. Our research and practice of the fighting moves of the Viking-age warrior continues at Hurstwic's dedicated training facility. Please join us in our training! A complete list of references to arms, armor, and combat in the Icelandic sagas is available for downloading from the Hurstwic library.